I think this novel by H. G. Wells, published in 1896, holds up remarkably well, probably better than his other SF novels, and it’s still relevant. Wells tackles the issue of what it is that makes us human with skill and subtlety. It’s also one of those “warnings against the misuse of science” novels, but then science has been misused and will no doubt be misused again. A man is shipwrecked and finds himself on an island where strange things are going on. 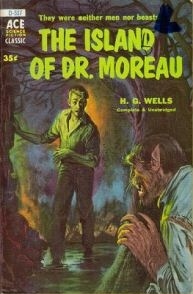 The mysterious Dr Moreau has a laboratory there but he’s rather secretive about his work. In fact he’s working on transforming animals into people by means of surgery and conditioning. The beast-men he has created are caught between two worlds, the world of animals and the world of men. The results are tragic. Many of Wells’ novels and stories are ruined by his rather silly political beliefs but fortunately that is not the case with this book. It’s also a rather moving story – you can’t help feeling sympathy for the unfortunate beast-men. Are we not men?